Microwaves were cool when we first got them, but the novelty wore off damn fast. They had almost settled down into the life of another boring mom appliance when out of nowhere came the red-packaged Micro Magic line. Mostly, we remember the fries. They cooked right in the carton (and tasted a little cardboardy, but don't question technology!) and it was a big thrill to be able to have french fries at home without having to turn on the oven and wait for-freaking-ever. There were burgers too, but the coolest item on the Micro Magic agenda was their MILKSHAKES. Yes, you put the milkshakes in the micro--hear me out. They arrived pretty solidly frozen, and a whir round in the Amana melted them just enough to get them to icy beverage perfection. 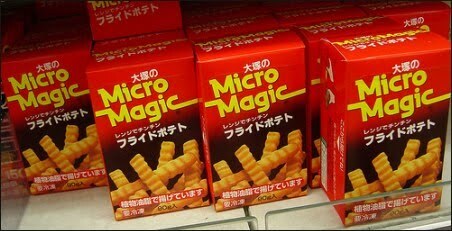 Matt from X-Entertainment remembers the Micro Magic fries well, and even has the encouraging word that they may be still available in Japan. Damn Japan. Green-tea Kit Kats, whiskey vending machines, Micro Magic. They get all the good stuff. I cannot BELIEVE YouTube had a commercial for these. Bless you, YouTube. Anyone else remember these treats? Micro Magic foods came out at a time when microwaves were a novelty and people were still learning what they could (and could not) do with them. I tried the milkshake once -- it was pretty mediocre, and far more trouble than simply cruising through the McDonald's drive-thru. The burger was simply awful. Much better were the White Castle burgers, especially since there were no White Castles near me at the time.